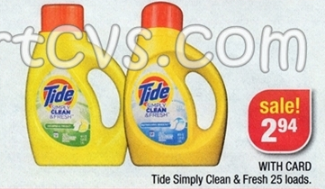 Don't miss this awesome Tide deal this week! Tide Simply Clean & Fresh is only $2.94 but when you use this $1.00 off any Tide Detergent you'll score it for just $1.94 each! Click on the coupon below to get yours and don't forget that you can grab 2 coupons!